Largest residential college in Australia: There are over 500 students at Ormond, including 350 undergraduate and over 60 graduate residents, and over 100 non-residents. Diverse intake: Our 2018 intake included students from over 100 different schools and universities from every state and territory in Australia and over 20 different nations. Our student intake consists of approximately a quarter each of the following groups: Melbourne, rural and regional Victoria and Australia, interstate and overseas. The College is close to 50/50 men/women, although we usually have slightly more female applicants and slightly more female first year students; this reflects the stronger numbers of female students accepted to The University of Melbourne. A presentation to your Year 12 students about College life and how it can help them make the most of their university experience. Our Executive team travel frequently and would be keen to visit your school. We also offer Skype presentations. 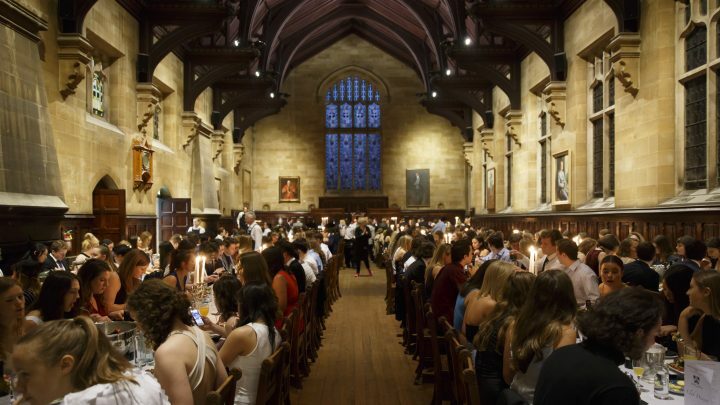 Bring in your Year 12 students to have lunch in our renowned Dining Hall – a unique experience! Tour Ormond College during The University of Melbourne Open Day – Sunday 20 August, 10am-4pm. More than 30% of Ormond students receive some form of financial assistance. For first year students, financial assistance includes scholarships and bursaries. Financial assistance can be awarded based on a number of criteria, including academic excellence, personal background (i.e. Indigenous, rural), degree to be studied, or leadership potential. All scholarships & bursaries are means tested. Students can apply to Ormond for the Semester 1 or Semester 2 intake. The largest intake is in Semester 1 but there are often over 30 places available in Semester 2. Applications to Ormond always exceed the places available, however, this should not discourage students from applying. We do, however, always advise students to have some alternative accommodation options organised. The Colleges share an online application process via the Intercollegiate website. See the full details of Ormond’s application process. The Selection Committee, made up of the Master and the Executive Team, carefully review each application and take into account many factors, such as the student interview, individual fit with Ormond, course, location (origin), school and family association. All applicants to Ormond College are offered an interview. This is an important element of the selection process and is conducted using a carefully developed standardised process, ensuring equity to every applicant. If you are not currently on our mailing list, contact us to receive hard copies of our brochure and two copies per year of our College alumni and community magazine, New & Old.